A major dynamic storm system is currently dropping heavy snow as far south as northern Mexico, and is poised to charge north into the Upper Midwest. All types of weather will be likely, from rain to freezing rain to sleet and snow. 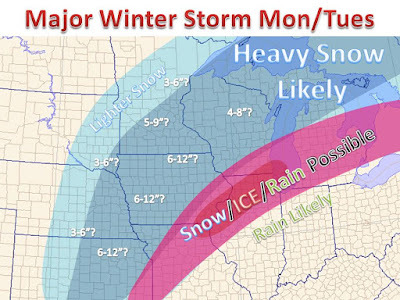 While the snow will be heavy, the real story could be a major icing event. Over a quarter inch of ice is possible, combine this with high winds, and a serious situation could unfold on Tuesday. Model consistency is not to the point where we would like it at this point, but the map above draws out the "most likely" scenario. Most models do take the heaviest snow from central Kansas north through Lake Superior. This has also been the trend to bring the storm more northwest than originally forecasted. However, there has been some model runs that shift the storm southeast and lay down 6-12" of snow in eastern Iowa to southern Wisconsin and Lower Michigan. This will need to be a trend to watch. Either way, a widespread swath of 6"+ is very likely across the Midwest Monday into Tuesday. The thought is that this model (the GFS) will shift northwest again to follow its other fellow models, in the next few runs. Be sure to monitor the latest forecasts and keep it here to Midwest Weather for updates, You can also follow me on Twitter for more discussion.